Driving on an improperly repaired tyre is dangerous. It can not only further damage the tyre but can also allow its strength to deteriorate over time. An improperly repaired tyre driven at high speeds may suddenly fail, causing loss of vehicle control. Continuing to drive on a tyre with a slow leak may allow moisture to seep around the object and into the tyre. This will reduce the probability that the tyre can be repaired properly because the moisture will ultimately reach the internal steel and fabric cords used to reinforce the tyre and possibly cause rust and loss of strength. 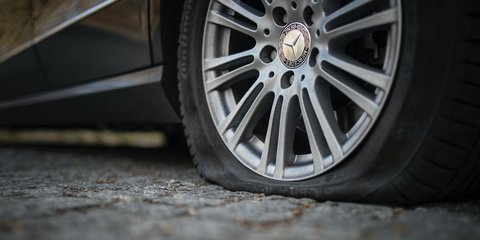 We locate and mark the injury, removing any foreign object still puncturing the tyre. Then we remove the tyre from the wheel and have a tyre expert thoroughly inspect it both internally and externally. We then prepare the puncture channel from the inside of the tyre using a 6mm carbide mill cutter. We repeat the process, now from the outside of the tyre inwards, ensuring once finished the channel feels resistance free on the mill cutter. Once done we clean the area using a specific pre-buff cleaner and repair scraper. Making sure to remove all residues such mould releasing agents. We then buff the inner liner and make sure that any raised ribs are left flat after buffing. We then apply a specialist vulcanising accelerator solution to the puncture channel and buffed area. Insert the combination tyre repair patch and plug (required by law) into the puncture channel. We then pull the combination tyre repair patch and plug outwards until the entire patch is flush with the inside of the tyre. We then roll the reverse of the patch using a corrugated tyre stitcher. We roll from the centre of the patch outwards to remove any air bubbles, making sure the entire patch has solid contact with the buffed inner liner. Then we seal the combination tyre repair patch and plug base and buffed area still exposed with an inner liner sealant. We cut the stem of the combination tyre repair patch and plug flush with the remaining tread of the tyre, after first mounting the tyre back onto the wheel and re inflating to the correct pressure. The tyre is then pressure tested. Then finally we balance it again which is crucial as the tyre has been removed. As you can see we use a number of materials when repairing a puncture. Tyre glue, combination patch plug, balancing weights, bead seal and also a new valve. The diagram on the right shows where repairs can be made and where they cannot. be damaged beyond repair, a thorough examination will be required. through, step by step, the reasons to why it cannot be repaired. you can obtain a second opinion should you so wish.